We were standing in the only street of this small village called Mohda. Located in the forested region of Chhattisgarh, the village had no access to the road and markets. The women of the village surrounded me. They wanted me to know that malaria was a serious problem for them. They wanted something to be done about it. I was taken aback because we were talking about solar energy—the state government had set up a small power station in the village, and we were there to learn more about it. “What’s the connection?” I asked. Pat came the answer, “Don’t you see that we need fans at night so that we can drive away the deadly pest?” We don’t often notice that electricity is one intervention in the fight against malaria. “So, why don’t you get a fan—after all, you have a solar power plant in the village?” I asked. Now their anger spilled over. The solar plant provides electricity only for a few hours in the evening and that too enough to light only two bulbs, they explained. Officials were quick to rebut this claim, “All the people in the village have television sets. Many, in fact, have colour TV, which consumes more power. This trips the power plant, and we do not have enough to provide assured energy to all,” they said. This clearly is not the way to go. The shift to clean solar power is a great opportunity for villages unconnected to the power grid. It brings energy, which in turn, is the starting point for literacy, communication and productive work. But currently, most distributed solar energy programmes are based on giving households a few photovoltaic (PV) panels and efficient light bulbs. This does not meet their aspirational needs. Solar, then, becomes the energy source for the poor, because they are poor. It will never provide the transition for millions living in darkness to power through a non-fossil trajectory. Chhattisgarh has, in fact, done something different. 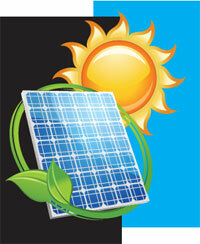 It has set up solar mini grids in villages rather than provide PV panels to individual households. Under this programme the Chhattisgarh Renewable Energy Development Agency (CREDA) sets up an array of solar panels at one place and then distributes power to households through a mini-grid. Some 1,400 such systems are in remote villages not connected to the grid. To ensure that they run smoothly, CREDA has hired technicians. It is a pioneering scheme. So, why the complaints? For one, the plants are small. Demand for energy was assessed 10 years ago; the capacity was based on the requirement of two light bulbs per family. In Mohda, a 4 kW plant was built to meet the lighting needs of 55 families. In neighbouring Rawan a 7 kW plant was planned for 130 CFL bulbs but now there are an additional 150 lights, 25 television sets and 100 mobile phones. This change suggests economic growth and should be welcomed, but officials see the higher use of electricity as “illegal” as the system is not built to provide for growth. The fact is these systems can be upgraded. That is why mini grids are preferable. But then we need a financial model that can give the poor access to expensive power. At present, the state government pays the full cost of setting up and running the system. It does this by charging a small cess on every unit of grid-based electricity provided to consumers in the state. But while the government pays Rs 45 per household to the local operator to run the system, a household pays only Rs 5 per month, regardless of its consumption. Clearly, this makes the system self-limiting. This is what happens in grid-based power, where costs are mammoth but get subsidised. The subsidy often hides the inefficiencies of the distributing utilities. This is also the reason governments cannot reach power to the people—the costs are not paid and so the system collapses. In the case of distributed renewable energy, there are no options but to fix this. The capital costs are not insignificant—everything from a power station to the distribution system has to be built. The advantage is that once the system is built, the recovery of electricity bills is easier because the user has a direct and close relationship with the supplier. My colleagues are proposing two approaches to fix this. In places where the grid will never reach, the capital cost should be subsidised but the operation cost should be paid for based on consumption. This gives incentives to increase supply. In villages where the grid will reach (sooner or later), the cost of the system be paid through a feed-in-tariff, as is done in the case of large solar plants. In this case government pays the differential between the costs of setting up and running the system and the power rate recovered from people. Today the poor pay for energy needs—in these villages we found they spend between Rs 150 and Rs 200 for kerosene just for light. Paying the differential can ensure feasibility. What’s more, the system interacts with the grid. It can sell excess power or buy power and then supply it to the village. In this way, energy generated in millions of villages can light the homes of millions and many more. This is the revolution we are waiting for. I am glad CSE has taken up this important issue of monitoring and regulation of solar mini grids in the country. Excellent Editorial Madam. As usual you are thorough with your study on the subject. In rural India, despite decades of electrification programs, about 400 million people making up half of all households still do not have access to electricity. SERC has recently joined a consortium of U.S.- and India-based energy experts to assess the feasibility of building solar photovoltaic mini-grids as a solution to the high cost of electrification in remote areas. These systems would each consist of a single solar generation station per village with a distribution network to provide power to all nearby homes and businesses. If successful, this model could be widely replicated at lower cost than providing each home with a stand-alone solar system. SERCÃ”Ã‡Ã–s role in the project will include performing a literature survey of similar projects that have been installed in other developing countries, an assessment of how Indian energy policy and regulations affect the project, and field studies to estimate energy demand and willingness to pay for electricity in the participating villages. We will provide technical assistance to the rest of the team on several other project tasks. The project is jointly funded by the U.S. Trade and Development Agency and Azure Power of India. San Francisco firm Energy and Environmental Economics (E3) is the lead consultant. (SERC News). of the system depends on the usersÃ”Ã‡Ã– satisfaction. the project lifetime and ensures revenues. in-kind participation, connection fees, and the village committee. Binding contracts are needed to secure local involvement and for the sake of the operation. Penalties enforcing this contract are fundamental. rates must supply O&M funds, as well as replacement costs. take over some aspects is preferable. tend to be very site specific. impacts on the community and generate the needed revenues. credits; low import duties; site surveys; market studies; and capacity-building. river with specific flow rate and volume conditions. studied beforehand. However, prices are normally lower than PV. be more expensive than the other technologies. discharge, but this can be managed by using a diesel generator as a backup. future expansion of the mini-grid. national grid, but only if the mini-grid has the same technical standards. the mini-grid and as a consequence, the investment cost and financial viability. awareness raising and local availability of energy-efficient appliances. To involve local communities and to provide power for lighting and gas for cooking,tbiogas from Opuntia and agave and subsequent power are the best option. These are care-free growth plants which can be raised in Waste lands. There are many other uses of Agave/Opuntia. Agave is a versatile plant well suited for millions of hectares of wastelands in India. Ethanol(1st and 2nd generations),Biobutanol,biomethanol,biojet fiel,green gasoline,biooil,biocrude,biodiesel,biocoal,biochar,H2,syngas,biogas,torrefied pellets and briquettes, drop-in fuels,pyrolysis oil,and biochar. Agave syrup(kosher),Powder inulin,healthy sweetners,far substitute(ice cream),bioplastics,cellulose,paper,acids,CO,CO2,biopolymers,pressed boards,geotextiles,fibres,phenols,adhesives,wax,antifreeze,film(food wrap),fertilisers,insulating foam and panes,gel,pectin,non-wooven material9disposable diapers),mouldings,concrete additive,food additives,composite materials,esters,substitute for asbestos, in fiberglass,hydrocarbons,petrochemical precursors, activated coal,secondary metabolites,detergent,glycols,furfurans,resins,polyurethanes,epoxy,aromatics,olefins,paints and lubricants. Pellets and briquettes,syn-gas,biooil,biocoal,biogas,biochar,H2 cells,ammonia,and pyrolysis oil. 1. Uses marginal dry-land (41% of the EarthÃ”Ã‡Ã–s surface). 2. Most Efficient use of soil, water and light. 3. Massive production. Year-round harvesting. 4. Very high yields. Very low inputs. 5. Lowest cost of production among energy crops. 6. Not a commodity, so prices are not volatile. 7. Very versatile: biofuels, bioproducts, chemicals. 9. Enhanced varieties are ready. Mexico is pioneer in utilising every part of Agave for commercial exploitation. Will India follow? Ours is an agrarian economy. Let us utilise our resources fully so that there will be more rural employment and climate change abatement by providing CAM plants. Together with such living systems the PV systems discussed in the CSE article here may become viable. I know this is completely out of the way. I am sorry for that! I happened to see video "Moily's metro ride: austerity measure or photo-op?" on NDTV Web site. You were one of the panelists. You looked different from your picture on your Web site, actually much younger. So if you agree, please consider changing your picture on your Web site. Please explain how one square kilometer of planted tree will provide the 1800 MW of energy.Is it by gasification or any other technique.